Every year I start chapter reading with my preschool class on ‘day one’. And, the first book I read is Charlotte’s Web. We have barely had three weeks of school and children are totally hooked. They adore Wilbur and laugh at the goose repeating words three times. They trust Charlotte. They have met Templeton the rat, and learned of Wilbur’s fate. When Charlotte’s demise looked imminent in the hands of Avery’s big stick, there were gasps. I am reading to three and four-year-olds about the beauty of life and the fear of death, about morals (and lack thereof), and about friendships (and lack thereof). That sounds pretty sophisticated for preschoolers, but leave it to the beautifully crafted words of E.B. White. Twilight settled over Zuckerman’s barn, and a feeling of peace. Fern knew it was almost suppertime but she couldn’t bear to leave. Swallows passed on silent wings, in and out of the doorways, bringing food to their young ones. From across the road a bird sang “Whippoorwill, whippoorwill!” Lurvy sat down under an apple tree and lit his pipe; the animals sniffed the familiar smell of strong tobacco. Wilbur heard the trill of a tree toad and the occasional slamming of the kitchen door. All these sounds made him feel comfortable and happy, for he loved life, and loved to be part of the world on a summer evening. That’s just what happens, every day at chapter reading. 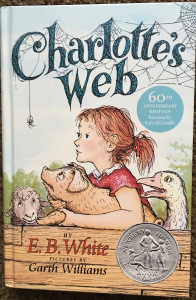 The beauty of Charlotte’s Web comes from learning about the world, and about every feeling that is important in order to grow into a good person. Goodness and knowledge, all on a farm. Thank you, Gabriel. You are now in high school, doing very well. Whenever you visit (once or twice a year), it means the world to me. And today I found the book you gave me. You loved Charlotte’s Web. That book went straight to your heart, and I know your heart wanted to give me something when you left my class and moved on to kindergarten. From my heart to yours, thank you! This entry was posted in Book Review, books, chapter reading, children's books, E.B. White, Early Education, Expressing words and feelings, Imagination, Inspiration, Learning About the World, preschool, reading aloud, reading aloud, Teaching young children and tagged books, chapter reading, Chapter reading books, Charlotte's Web, Early Education, language development, literacy, reading aloud, teaching young children. Bookmark the permalink. That is a lovely message to have re-discovered, Jennie. Thank you, Pete. It was a great find. Much like Dickens, E.B. White writes with the same character development and real life. You will love it! The past reaching out to the future, your present. How wonderful to find that lovely inscription! I read from one of my books to a grade one/two class. My books are not picture books and are classed as for grades 3 to 7. So I was worried the story would be beyond this group. Then one little boy put up his hand and said, “I like the words you use in your book. They paint a picture in my mind.” As you say, never underestimate children! I just love them. Wow!! What a story, Darlene. And that’s exactly what the words do. Like you, I will never underestimate children. Thank you! And this is why there are wonderful teachers like you. It must be such a special feeling to watch new little faces enjoying Charlotte’s Web year after year. Beautiful passage you chose. Those kids are so lucky to be in your class. Have a wonderful school year! P.S. Have you seen the new Mr. Rogers documentary? I thought of you during it, because of his insightful connection to the very young. It is the best, year after year. I stopped to read the passage twice to the children, telling them to listen to the words again and make those pictures in your head. “Can you see the kitchen door slamming shut?” I just loved it, too. Yes, I saw the Mister Rogers documentary. Wonderful!!! His wife and the producer of the documentary are the keynote speakers at the NAEYC annual conference. I cannot go. Can you imagine how wonderful that will be? Sorry to hear about your husband’s unexpected surgery. Sending best wishes for his speedy recovery! Thanks so much, Marcia. He had a tumor on his pituitary gland that was pressing on his optic nerve. All went well! I love children’s books so much for this very reason! I am certain the imagery and slight mind-expansion is also why they hold a universal age-appeal. I think so, too. When the words are well written, that always holds true. Many thanks! That was beautiful Jennie. Makes it all worthwhile! Indeed it does. Thank you, Opher. What a beautiful story, Jennie. I’m sure it means the world to Gabriel, that you mentioned his sweet gift. Thank you, Susan. I forwarded it to his mom. Hope he sees it. I love watching my students respond to this book. This year I need to find a different book that is just as good as I kept some of my students! The Story of Doctor Doolittle and Mr. Popper’s Penguins are always winners every year. I highly recommend them for you. What a warm, lovely post, Jennie. I’m glad you shared it. Hugs. Thank you, Teagan. So glad you enjoyed it. Hugs! Out of the mouths of babes! And when Fern’s parents were having the same conversation John Arable said something like, “Maybe our ears just aren’t as good as hers.” Thanks so much, Anneli. It was a treasure to find that inscription. What a great discovery, Jennie! And what a wonderful book to read to children. 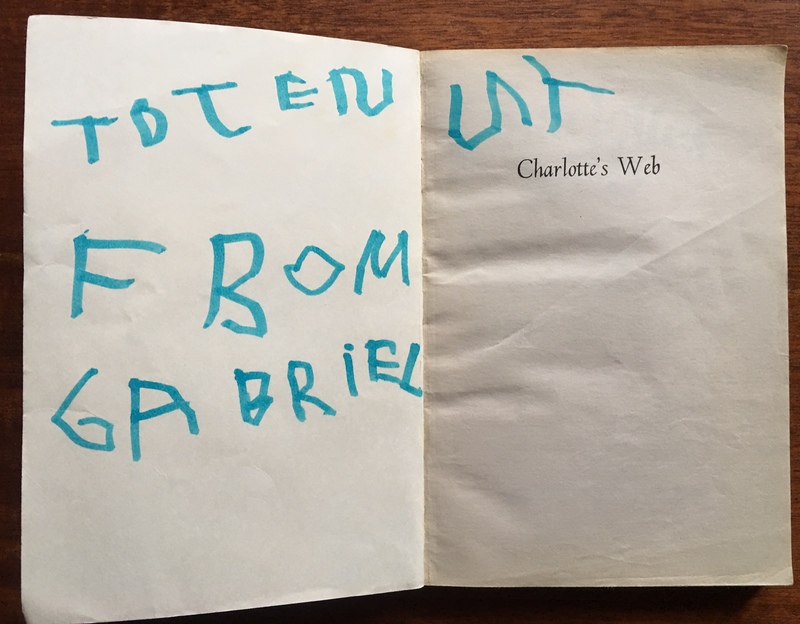 I discovered Charlotte’s Web through a teacher many years ago. I’m so grateful to have been introduced to this book! It really is one of the best. I’m so glad you discovered the book. And finding that inscription – priceless. This book just never gets old, Jennie. I’m so glad to see it’s still being read to kids. It must be an especially good feeling to have former students visit you, Jennie. All the comments in the world can’t top that! Jennie, this is absolutely wonderful! Charlotte’s Web one of my favorites since 1952 when I read it to my little sister. So glad to hear little ones are still enjoying it. Still a favorite, Dayne. One of the best! Your stories, your posts always inspire me so much. You are a wonderful teacher. What a gift you are giving and have given your students Jennie. This book is one of my favorite children’s stories too.